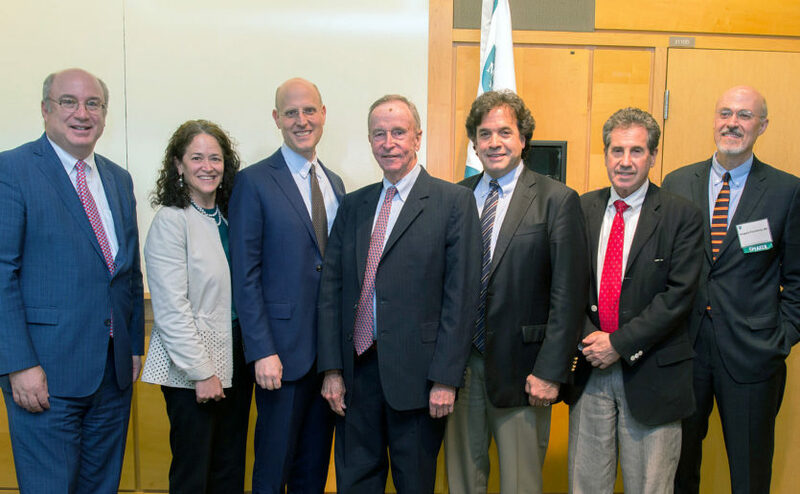 Henry McCance (center) with (from left) Peter L. Slavin, MD, president, Mass General; Merit Cudkowicz, MD, chief of Neurology; Jonathan Rosand, MD, chief of the Division of Neurocritical Care and Emergency Neurology; Rudolph Tanzi, PhD, director of the Genetics and Aging Research Unit in Mass General Institute for Neurodegenerative Disease; Jerrold Rosenbaum, MD, chief of Psychiatry, and Gregory Fricchione, MD, director of the Benson-Henry Institute for Mind Body Medicine. With insights acquired through a lifetime of venture capital investing, Henry McCance is fueling collaboration among top brain scientists and clinicians from across multiple disciplines at the new Henry and Allison McCance Center for Brain Health. Just as Allison McCance once had a strong tennis serve, her husband, prominent venture capitalist Henry McCance, is serving up a powerful challenge to Massachusetts General Hospital clinicians and scientists: to preserve and promote brain health. Motivated by Mrs. McCance’s long and difficult struggle with Alzheimer’s disease, the McCance Foundation and Henry McCance have made a transformative gift to launch the new Henry and Allison McCance Center for Brain Health. Its singular mission is to unleash the innovative scientific skills of Mass General researchers and the expertise of Mass General clinicians to help people maintain a healthy brain over a lifetime, just as cardiologists have done for heart health. A collaborative clinical and research effort, the center will be led by three internationally renowned experts: Rudolph Tanzi, PhD, vice chair of the Department of Neurology and director of the Genetics and Aging Research Unit in Mass General Institute for Neurodegenerative Disease; Jonathan Rosand, MD, chief of the Division of Neurocritical Care and Emergency Neurology; and Gregory Fricchione, MD, director of the Benson-Henry Institute for Mind Body Medicine. “We are lucky to have not one but three visionary world-class scientists to lead this venture,” Mr. McCance told an audience of clinicians, researchers and philanthropists at the opening celebration for the center on May 31, 2018. Such collaboration has always been key to the ventures Mr. McCance has chosen to support. “We dare to be great and to do so, we must collaborate,” Mr. McCance says. Mass General is an international leader in the neurosciences, which include neurology, neurosurgery, psychiatry, psychology, neurogenetics, integrative medicine, neuroimaging and others. The new center creates a unique opportunity to focus these overlapping disciplines on the multifaceted challenges of brain disease. Rather than seeking a cure for those already in the grip of Alzheimer’s disease or dementia, the center will work with patients at every stage of brain health. After his wife was diagnosed with Alzheimer’s in 2000, Mr. McCance joined other philanthropists to found the Cure Alzheimer’s Fund. Over time, the fund came to support more than 60 collaborative researchers around the world including Dr. Tanzi. The focus of the Henry and Allison McCance Center for Brain Health will be somewhat different. Rather than seeking a cure for those already in the grip of Alzheimer’s disease or dementia, the center will work with patients at every stage of brain health. The stages are designated by color. Red for people, like Mrs. McCance, who already have active brain disease. Yellow designates those who show no signs of brain disease but who have risk factors such as having a close relative with Alzheimer’s disease or another brain disorder. Green is for people who have no symptoms or risk factors but who are motivated to preserve brain health. Mr. McCance says that because Mrs. McCance was afflicted with Alzheimer’s at the relatively young age of 58, their daughter is in the yellow category, or at high risk. The scientific backbone of the center will be a longitudinal study that will identify, over time, the factors that affect brain function. They include diet, exercise, sleep, medications, social interactions, education and many others. Ultimately, the center will develop a set of science-based recommendations to help people maintain healthy brains. A growing of body of evidence points to practical steps that can protect the brain from deterioration over the long term. Dr. Tanzi says they include getting enough sleep, exercising, managing stress, socializing, learning new things and eating plenty of vegetables and fiber. But more must be done, Dr. Tanzi says. Already, drugs are being tested to reduce neuroinflammation — a harmful response to immune system activity in the brain that begins long before any symptoms appear. For the McCance family, the new center signifies hope that younger generations may be spared the deterioration that Mrs. McCance is experiencing. Mr. McCance has turned his gaze to the future and put his hope in the innovative scientists and clinicians of Mass General. Early in her disease, Mr. McCance filled the void by acting as her caretaker, taking her to appointments, compensating for memory lapses and generally navigating day-to-day life as the once elegant athlete and mother declined. But over time, his daughters, Elizabeth McCance and Ellen McCance Pinschmidt, grew concerned about the toll it was taking on him. “Eventually, my daughters ganged up on me and said, ‘Dad, you have to get a caretaker!’” recalls Mr. McCance, whose wife now has a personalized support system. To learn more about the Henry and Allison McCance Center for Brain Health or to make a donation, please contact us. Help prevent brain disease and preserve brain function across the lifespan.